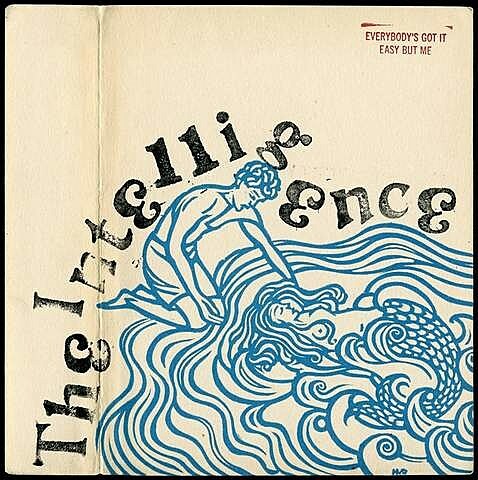 Smartass post punks The Intelligence are back with a new album, Everybody’s Got it Easy But Me, that’s out via In the Red on June 19 . Like on 2010’s Males, main brain Lars Finberg is eschewing the scuzzy reverb-mired roots of the band in favor of clean mid-fi production. Some of that nervy angst, so integral to 2009’s Fake Surfers, is back, however, with room for a few barn-burners, a couple introspective numbers and a cover of Del Shannon’s “Little Town Flirt” where Finberg duet’s with Shannon of Shannon and the Clams. It’s a teriffic record. You can download the LP’s ripper of a first single, “They Found Me in the Back of the Galaxy,” at the top of this post. (Snippets of the whole album can be heard here.) Cover art and album tracklist are below. Finberg, who has also played in Thee Oh Sees and Wounded Lion in the last year, recently relocated Seattle to Los Angeles, and apparently has LA and Seattle versions of the band. (No tour dates yet.) The added sunshine of his new home doesn’t seem to have affected his outlook on the world just yet, though the album — the band’s seventh — opens with a song called “I Like L.A.” We’ll see if Finberg ever finds love. “They Found Me in the Back of the Galaxy” will also be on one side of a split 7″ that The Intelligence is sharing with Kelley Stoltz. Speaking of, Stoltz has a new 7″ single out via French label Les Discs Steak that you can stream below.